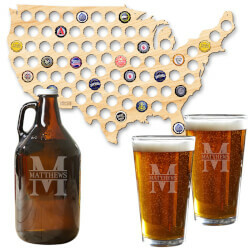 "USA Beer Cap Map and Custom Beer Growler Glass Set"
"There are countless great things about the United States of America, not the least of which is beer. If you enjoy that particular offering and love the country that offers it, our USA beer cap map and Oakmont beer growler set is perfect for you. You can secure up to 81 of your favorite craft beer caps in this large 23.5 x 14.5 x 0.25 cap holder. Crafted from American Birch they include pre-drilled holes for easy mounting once you add your caps. Our beer growler set includes one 64 oz amber growlers and two pint glasses each engraved with our Oakmont design. All glassware is personalized with a name and initial of your choice making these sets thoughtful gifts for men on birthdays, holidays and more.Set comes complete with beer growler, beer cap map, and two beer glassesMade of handsome 1/4"" Birch plywood, measures approximately 23.5"" x 14.5""Comes pre-drilled ready for hanging (use finish nails)Personalized with a name and intial of your choice"
1 Voice Beanie: Wireless Headphone..